Homepage. This page: An interesting old invoice from 1944, for deliveries made by a lorry haulier in Elland, Yorkshire. Crowther & Pickup Limited - Haulage Contractors. 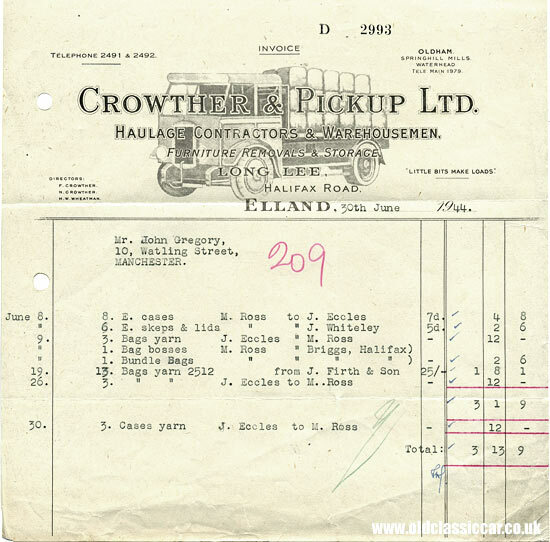 Crowther & Pickup Ltd were "Haulage Contractors & Warehousemen" operating lorries from their transport yard on the Halifax Road, Long Lee, Elland. The invoice shown below is dated 30th June 1944, at a time when WW2 was still in full swing and fuel supplies hard to come by. They also offered removals and storage. This invoice relates to several loads delivered for a Mr. John Gregory of Watling Street in Manchester, during June '44. John Gregory was a cotton and yarn merchant, supplying businesses across the North of England. All manner of yarns and other textile-related goods were produced at their 10 Watling Street factory. The wartime invoice features a very nostalgic illustration of a 1930s motor lorry, complete with a load, with the slogan "Little bits make loads" alongside. More motor-trade related invoices can be found in this Motoring Collectables section of the oldclassiccar site. Other road haulage items featured include a handbook and certificate issued by the Commercial Motor Users Association, the Bedford Drivers Club, a booklet for the Albion Transport Hotel, items relating to the Western National coach company, and a selection of other trade invoices and receipts.